A common Iowa sight: a rig spreading herbicide on glyphosate-tolerant soybeans. Photo credit: clisenberg John Deere 4730 via photopin (license). A year or so ago I was listening to a candidate (who will remain unnamed) for a federal office (that will remain unnamed). This candidate sounded reasonable and I agreed with most of what I heard – except for a call to label products made with genetically modified organisms (GMOs). I challenged this assertion. There is no evidence, despite extensive testing, that consuming GMOs poses a health hazard. Labeling would feed unfounded fears. 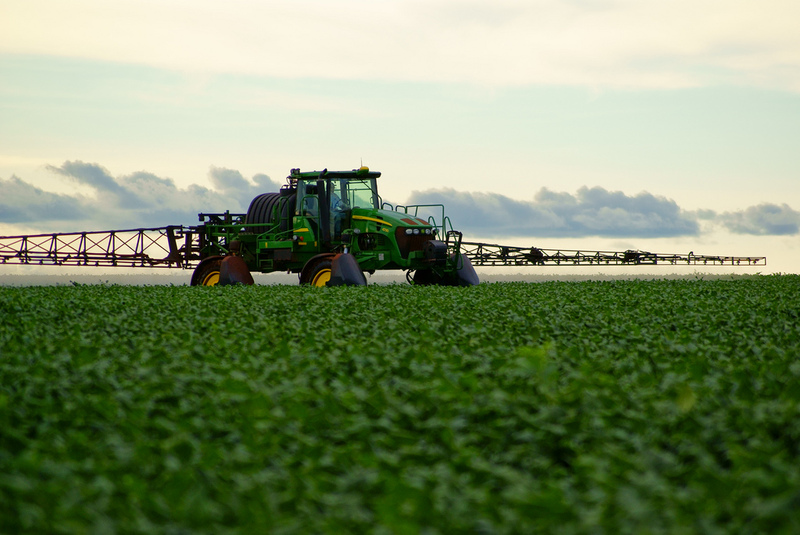 Another person turned to me and said that may be so, but planting GMO crops that resist specific weed-killers and insects encouraged farmers to overuse pesticides, putting the environment at risk. It only occurred to me later to ask: How would labeling fix that? And in any case, recent research out of Iowa, Kansas, and Michigan state universities and the University of Virginia suggests the GMO-pesticide connection may be more complicated than we think. In some cases, planting genetically engineered (GE) crops may lead to more pesticide use, but in other cases it leads to less. And when a pesticide’s environmental impact is taken into consideration, the picture gets even cloudier.